The original Microsoft Surface Book was one heavyweight (literally) laptop-meets-2-in-1 that, ultimately, was designed for professionals seeking desktop-grade power in a portable form factor. It had all the makings to give Apple a big kick between the legs, showing that Microsoft has found its groove when it comes to hardware. The follow-up Surface Book 2 is a nip and tuck rework of that original device, designed to deliver the best portable desktop-like experience, in either 13.5- or 15-inch models. It's the former, smaller form-factor device that we have on review here. So just how well does the sequel hold up? Look twice and you won't be able to tell the difference between the first- and second-generation Surface Book. Such is the nature of tech design. The two are identical by eye, but there are some tweaks within that make the newer model all the more desirable. First up, the so-called "fulcrum hinge" - the distinct and slightly curved hinge between screen and keyboard - holds the screen in a little stiffer than before. This is a savvy update, as we bemoaned how the original Surface Book had a bit of "wibble" sometimes when poking fingers at the touchscreen. That's semi-fixed - although it's still not perfect, frankly, because the screen contains a battery and is therefore heavy. Second, there's yet more power on board. Like, heaps of power - if you want to pay for it. With the latest 8th Gen Intel Kaby Lake chipsets under the hood, there are a variety of options to choose from - ranging from the Core i5 through to a quad-core Core i7. Oh, and just the small fact of Nvidia GTX 1050 discrete graphics (up from the GTX 965 from before) ensuring this is a total powerhouse. Interestingly, the Intel Core i5 model (which we don't have on review) doesn't require fan cooling, as the innards have been tweaked to improve heat conductivity by using some ceramic materials. This also helps with the fan-cooled higher-power chipsets, although Microsoft's claim of 17 hours of battery is more than a reach in the higher-powered models, such as the top-spec Core i7 (as on review here), if you're using it for typically demanding applications. Other than the inevitable price jump - believe us, it can get really expensive, pushing up to £2,999 territory - and the addition of a USB-C port in place of the Mini DisplayPort, those are the primary differences between first- and second-gen models. A design to die for? When the original Surface Book was first revealed in October 2015, it was a total surprise, met with gasps of excitement by the audience at Microsoft's unveil. Microsoft releasing a laptop, but, like, wasn't that against the laptop-free future that Surface was meant to be all about? Not really: the Surface Book 2 feels about 80 per cent laptop, but as the screen can be released to form a mega-tablet, it adds extra versatility. The latest model is also Surface Pen and Surface Dial compatible, providing yet more freedom to creative professionals (and a bigger bill, too). As laptop-like as it may appear, using the Surface Book 2 as a literally lap-bound device does find its limitations. As the screen has a battery component it's rather top-heavy. And to avoid it tumbling over, that means Microsoft has to restrict how far the screen can angle backwards - which, for us, feels a little restrictive, as we said of the original model. But, as we say, it's not 100 per cent laptop. With a physical key (positioned at F13) on the keyboard to release the "muscle-wire" lock system, the Surface (i.e. the screen component) can be elegantly pulled away from the Book (we supposed it can be called that) with ease. It's a neat solution, which ensures the two parts aren't ever going to go flying off in different directions. This release mechanism is software controlled because the CPU and GPU exist in opposite parts of the device - and if you go ripping those apart when an intense application is using both it's not going to end well. Hence the release button can refuse separation (by flashing red) if you've got an application using both CPU and GPU. On the ports front, the addition of USB-C is welcome, especially as it doesn't do away with the duo of full-size USB ports. And we're particularly fond of the full-size SD cart slot, too. If you need more ports, or will miss the Mini DisplayPort then, well, you'll have to go buy a Surface Dock to get a handful of extras. The screen is a rather delicious looking slate, too, offering a 3,000 x 2,000 pixel resolution across its 13.5-inch panel. Microsoft calls it PixelSense, we just call it sharp and colourful. However, it doesn't reach the full DCI-P3 standard that Apple does with the MacBook Pro, which might be a killer blow for photographers eyeing up this 2-in-1. That's a shame for this follow-up, as there was the capacity to enhance the panel, rather than just reusing the one found in the original Surface Book. Just like before, the screen's finish is somewhat glossy, too. This can help content to look more contrasty, but also pronounces reflections a little more than we'd like. It's never hard to read content, though, as there's plenty of brightness and decent viewing angles, but a more matte panel might suit its pro-target audience all the better. One nifty thing about the Surface Book 2 is that the screen can be repositioned for multiple usage scenarios. Go with standard laptop. Flip the screen around by 180 degrees into a stand mode, for presenting. Fold the panel to almost flat, but not fully, as the hinge gives it a minor slant that makes it more comfortable for drawing onto. Or simply detach it to have a large-scale, touch-sensitive tablet to carry about from office to office when pulling together ideas. It's this variety that establishes the Book 2's outlook. For this review we've been handed the top-end 13.5-inch model, which means there's heaps of power on board. The entry-level Surface Book 2 doesn't come with the Nvidia discrete graphics, nor does it require fan cooling, so if battery life is your priority then that ought to be the longer-lasting choice. 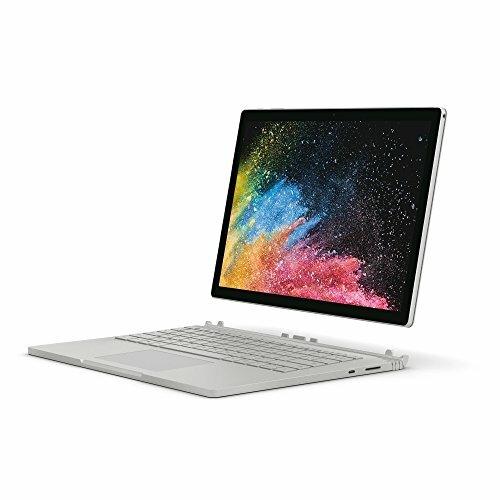 That said, going entry-level is almost at odds with what the Surface Book 2 is about - and if you want fanless then we'd recommend the altogether more portable Surface instead. The Book 2's battery life is said to last for up to 17 hours - which, for normal use, is a bit of a stretch. That's Microsoft's quote for simply playing video. Our video test saw it run for 13 hours when streaming video full-screen. But as this a workhorse laptop, well, we highly suspect you'll be buying one to push it much harder. In the case of the Intel Core i7 with 16GB RAM and an Nvidia GTX 1050 - as we had on review - you can almost cut the purported 17-hour battery life in half if you're Photoshopping away like mad and delving into CAD. Which, on reflection, is a standard office day's hours, so isn't a bad innings at all. Furthermore, Microsoft offers a four-step Power Mode within Windows 10 - easily accessible by clicking the battery icon - which can select between Best Battery Life and Best Performance. If you're fine with some throttling of all that power then slide it down; if you need to be running real-time models and such like then open it up for the fullest performance. In short: we were expecting the Surface Book 2's battery to be so-so but, all things considered, it provides a pretty solid innings - earning it that professional workhorse badge. It'll more than give a MacBook Pro a run for its money, while offering yet more power on tap. [Note: the 15-inch model has some reported battery issues due to more powerful Nvidia graphics (GTX 1060, not 1050), which isn't an issue for the 13.5-inch model (as reviewed)]. As an update to the original, the Surface Book 2 makes some neat nips and tucks - mainly under the skin, with improved power and performance - that add up to make this Microsoft a seriously powerful contender for Apple's MacBook Pro. The Book 2 is more versatile, for starters, given its touchscreen (no Touch Bar gimmickry to be seen here) and multi-function screen positions. Microsoft could improve the screen with a wider colour gamut and diminish the glossy reflective quality, however, plus a better-balanced design in terms of weight positioning would make the Surface Book 2 even more comfortable to use. As this second-gen device is so similar to the original, it's a shame these points haven't been addressed. Oh, it's also ludicrously pricey - ranging from £1,500 to £3,000 for what is, in essence, a laptop. In many areas that Microsoft Surface Book 2 is an unrivalled pro workhorse; a device more versatile than just a laptop. It further cements Microsoft's position as a hardware manufacturer to be reckoned with and, we suspect, will go down a storm with many creatives. If you don't intend to use it beyond its laptop form, however, then it's a high price to pay for the ultimate 2-in-1. Still, it'll be more than worth it for many. The other obvious product that's gunning for the professional market, the MacBook Pro still avoids a touchscreen and doesn't have as versatile functionality, but as a through-and-through laptop it's a thoroughbred in design, longevity, screen quality and - while outsmarted by Microsoft - power, too.